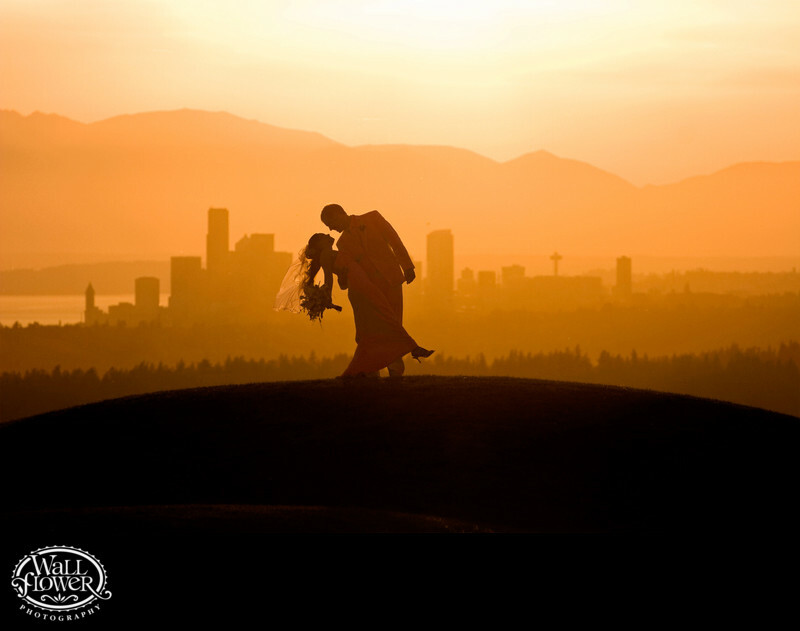 As sunset fell over the amazing view to the west from the Golf Course at Newcastle toward downtown Seattle, we brought the bride and groom out to a nearby grassy knoll for a quick portrait shoot. Although we came back with a variety of terrific photos, it was this one of the newlyweds silhouetted against that view as he gracefully dipped his beautiful bride that was our clear favorite. It has been one of Wallflower Photography's signature images ever since, and was also adopted by Oki Golf, which manages the Golf Club at Newcastle and several other of the region's best courses, to be a featured image in their wedding magazine ads and brochures. This photo also won an award in the International Print Competition (IPC) of the Professional Photographers of America (PPA), who accepted it into their General Collection.